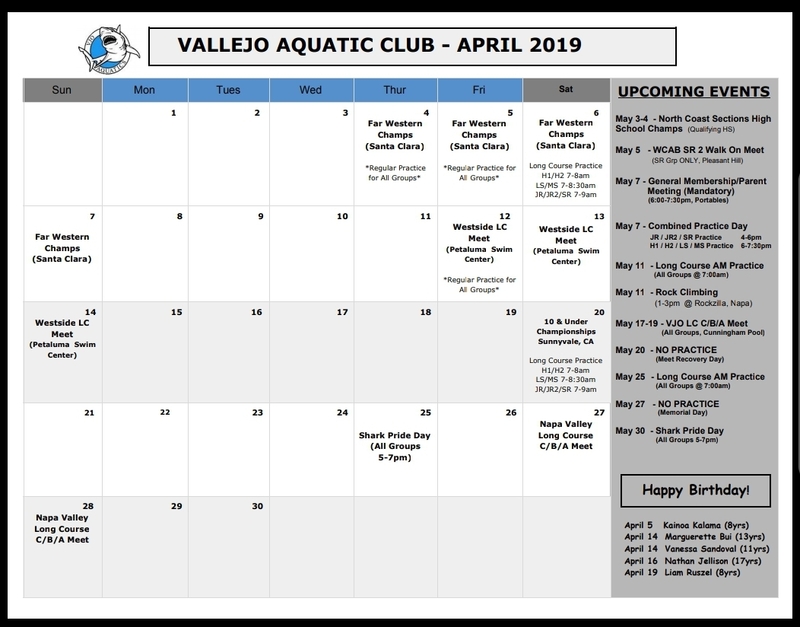 Vallejo Aquatic Club Go SHARKS! We want to remind all our swimmers and families that team suits and team caps are mandatory at all meet. This does mean for meet warm-ups and all races. We are a team! You can order a team suit and other team geaar at any time. Just take an order form down to Making Waves Swim Shop in Walnut Creek and place an order today. Make sure you try on a team suit first. Order forms for team suits, team parka's and team gear are attached below. Order Forms can also be found on our team website and at the pool. For team caps, see any of our VJO coaches (Latex- $5, Silicone - $12). On the following Saturdays we will be having long course practices. Most Saturday Long Course practice will be open to all groups This Saturday March 30th is ONLY open to the Senior, Junior 2 and Junior Groupers. This practice is a meet prep practice geared toward our qualified Far Western swimmers. Join us on Saturday May 11th from 1-3pm for Rock Climbing at Rockzilla in Napa. More details and flyer coming soon. The Westside Aquaducks Long Course C/B/A+ Meet on April 12-14 is STILL OPEN FOR ENTRIES. This will be our first long course meet of the season, so the meet will fill up fast. Please get signed up ASAP. This meet is recommended for all VJO swimmers. Hammerheads 1 & 2: Please talk to your coach before entering this meet. Your coach will advise you as to which events your child is ready to swim. Please do not enter events that your child is not ready to swim. This is a long course meet, so events are 50m and 100 m long (there are no 25’s offered). Senior /Junior 2 Groupers: All Senior and Junior 2 Groupers are swimming the 200 back at this meet. make sure you get signed up for this event. 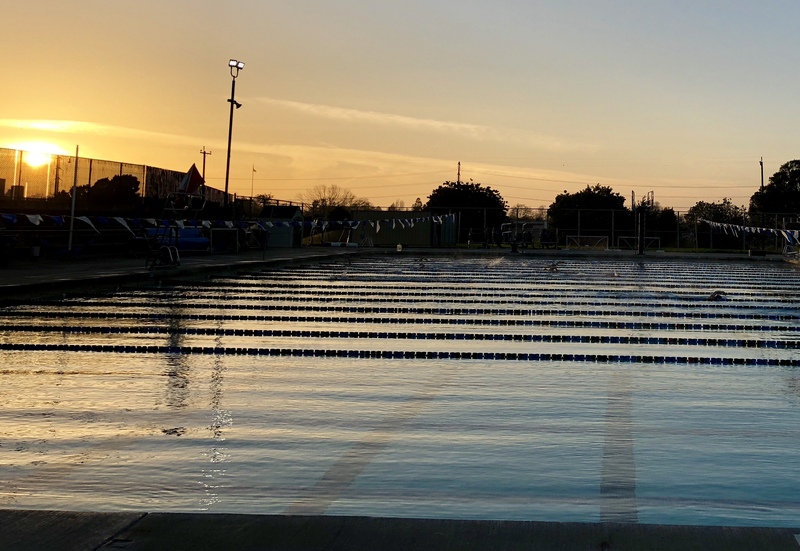 The 2019 Spring Far Western Championships will be held April 4-7 at the Santa Clara International Swim Center. This is a qualifying meet. All swimmers must meet Far Western time standard to enter. This is a Prelims/Finals meet, so the top 20 swimmers will come back again in the afternoon to compete again for points. TIME: Arrive at 7:00am each day. We will get in as a team to warm-up at 7:30am. The meet will begin at 9:00 AM each day. Warm-ups for Finals shall start one hour prior to the start of Finals. Championship and Consolation Finals shall start no sooner than 1 hour after the finish of the preliminary session including distance timed finals. The 10 & Under Championships Meet is NOW OPEN ONLINE for ENTRIES. The meet will be held on Saturday, April 20th in Sunnyvale CA. This is a qualifying meet. All 10 & Unders most have achieved the qualifying time standard to enter. TIME: Arrive at 7:00am, Warm-up with team at 7:15am. Meet will start at 8:30am. RELAYS: There will be relays at this meet. Our coaches will enter as many relays as possible. Relays depend on the number of VJO swimmers entered. EVENTS: Swimmers may compete in 4 individual events and up to two relays total. The Napa Valley Swim Team Long Course Meet is NOW OPEN ONLINE for ENTRIES. The Napa Long Course Meet will be held on April 27-28th at the Napa Valley College Pool. THIS MEET IS OPTIONAL - This is an optional meet for our all swimmers. We understand that many of our swimmers are already attending Far Westerns, Westside LC Meet or 10&Under Champs. However, the long course season is short and we only have 4 long course meets total. We are opening up this meet to our swimmers as another meet option if you are unable to attend one of our other Long Course meets. It is NOT a requirement to attend this meet. Please DO NOT attend this meet if you child is planning to attend 10& Under Champs the weekend before. TIME: Please arrive at 7:15am each day. Warm-ups will start at 7:30am and the meet will start at 9:00am each day. EVENTS: Please speak with your coach if you have questions about what events to enter. Hammerheads 1 & 2: Talk to your coach before entering events. Only enter events your swimmer is ready for. Hammerheads MAY NOT enter any breaststoke or butterfly events without prior approval from your coach. JR2 & SR Group: The event of the meet is 200 fly. All JR2 and SR swimmers should be entering the 200 fly at this meet. Our home VJO Long Course Meet is NOW OPEN ONLINE for ENTRIES. This meet will be held at our very own Cunningham Pool. All VJO swimmers are encouraged to enter this meet. This is our team designated meet for the month of May. Please remember that we need ALL FAMILIES to help to make our home meets a success. 10 volunteer hours are required for each family. JR2 & SR Group: The event of the meet is 800 free (fri night). All JR2 and SR swimmers should be entering the 800 free at this meet.